Here they are, the images that many of us have been waiting for. 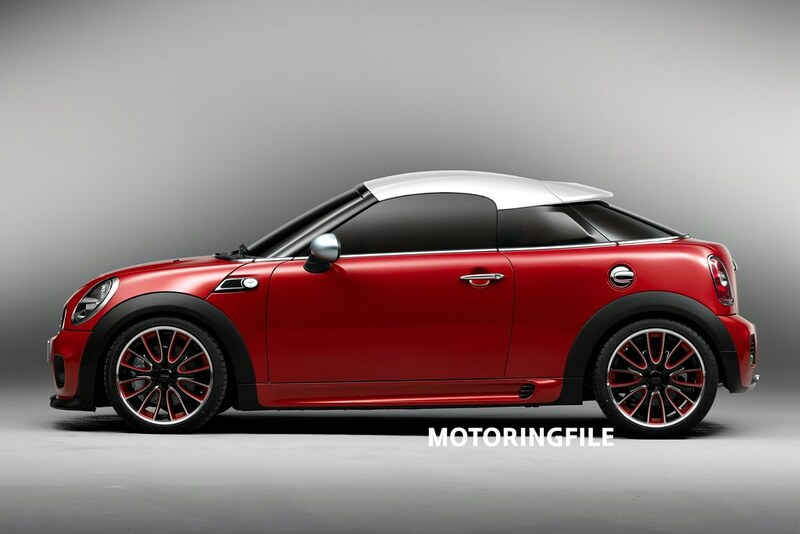 The MINI Coupe Concept uses off the shelf parts (it’s based on an R57 JCW) and a bespoke roof to all give us an idea of what will be coming in the next 18 months with the production MINI CoupÃ© drops. We’ll have more in the days and weeks ahead, but until then, here’s the official press release from MINI. And remember, we fully expect to see something very close to this car in production within 18 months. Official Release: MINI is celebrating a great birthday: Exactly fifty years ago, on 26 August 1959, the classic Mini was presented to the public for the first time, a unique story of success starting out and today giving MINI the perfect opportunity to look ahead without losing sight of the brandâ€™s great tradition. The MINI CoupÃ© Concept is an expression of MINI design and the great ability of the brandâ€™s designers to fill the elementary values of the brand with new life, using the options of modern drivetrain and suspension technology, and developing fascinating perspectives for the future of the brand on this basis. Presenting the concept of an uncompromisingly sporting two-seater to be seen for the first time at the Frankfurt Motor Show (17â€“27 September 2009), MINI is unveiling an unusually attractive vision of how the model family may well develop in future. The source of inspiration is once again the fundamental motive so characteristic of every MINI: driving pleasure. The MINI CoupÃ© Concept therefore represents the ideal of a car destined in every respect to offer a thrilling experience and make every journey a truly unique thrill. 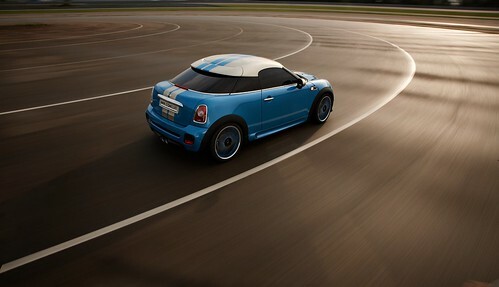 The MINI CoupÃ© Concept brings together a wide range of features for a truly sporting and ambitious style of motoring. Limited to two seats and following a philosophy of consistent lightweight construction, the car clearly meets all the requirements made of a particularly active and dynamic coupÃ©. Compact dimensions, perfect axle load distribution and a low centre of gravity offer ideal conditions for enhancing the agility typical of MINI to a level never seen before. Through its design alone, the MINI CoupÃ© Concept brings out all the thrill of individual mobility and the focus on pure driving pleasure. Powerful proportions and dynamic design language evoke a sense of desire and strong appeal, the MINI CoupÃ© Concept offering a particularly undiluted expression of the brand through its sporting and unconventional stance on the road. 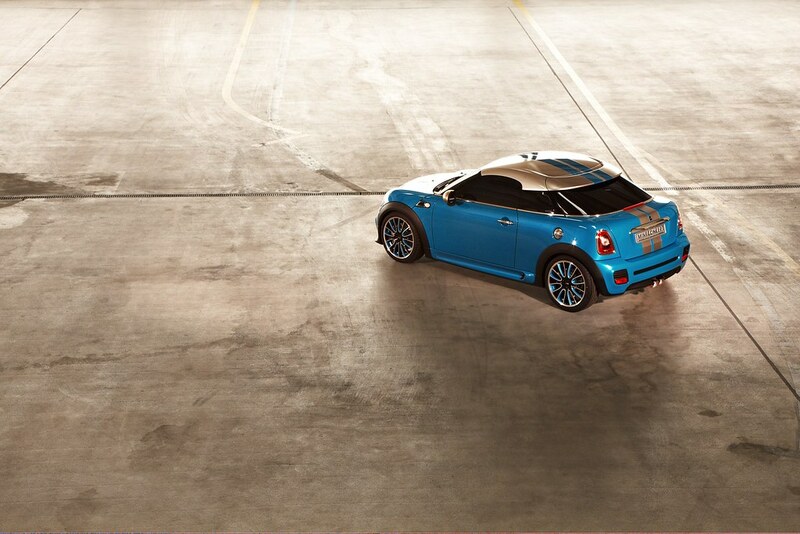 The MINI CoupÃ© Concept: an invitation to enjoy spontaneous mobility. The current models in the range already meet the most varied demands. As individual characters in their own right, the MINI, MINI Clubman and MINI Convertible all offer a unique rendition of the driving experience so typical of the brand. And now the MINI CoupÃ© Concept brings out driving pleasure in its most concentrated form, extreme lightweight technology making this two-seater particularly agile and unusually efficient. At the same time the low roofline, the precisely defined spoiler edge at the rear and other aerodynamic features enhance the carâ€™s performance to an even higher standard. 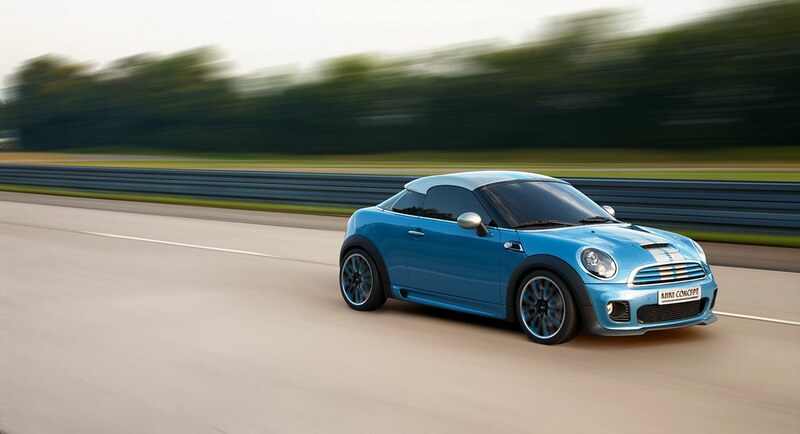 So that in its design and in the use of high-performance drivetrain technology, the MINI CoupÃ© Concept offers ideal conditions as a compact sports car in the premium segment. This two-seater is designed to accommodate even the most powerful engine currently available in the MINI â€“ and with the 1.6-litre twin-scroll turbocharged power unit carried over from the MINI John Cooper Works, the MINI CoupÃ© Concept offers truly outstanding performance. 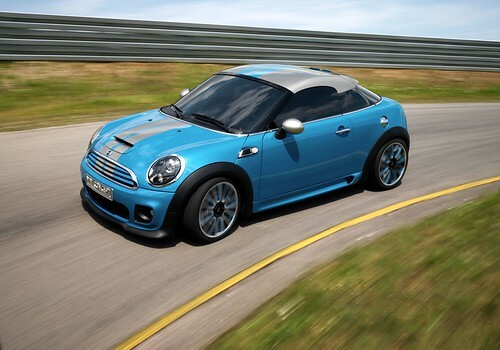 Maximum output is 155 kW/211 hp, peak torque 260 Newton-metres/192 lb-ft increasing through the Overboost function for a short while to an even more substantial 280 Newton-metres/206 lb-ft. And now the MINI CoupÃ© Concept offers everything it takes to exceed even the supreme performance of the MINI John Cooper Works with this unique power unit. At the same time this concept car clearly follows the BMW Groupâ€™s EfficientDynamics development strategy. More driving pleasure, lower emissions â€“ the MINI CoupÃ© Concept lives out this philosophy expressed by MINI as MINIMALISM in a particularly attractive manner. The MINI CoupÃ© Concept is a further milestone in this ongoing development of the brand. The car takes up elementary strengths of the MINI and, through its modern technology and an innovative body concept, offers new standards and characteristics never seen before. 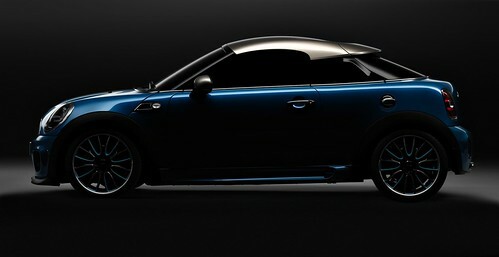 So that the MINI CoupÃ© Concept offers many new highlights in adding yet a further character to the existing model range. 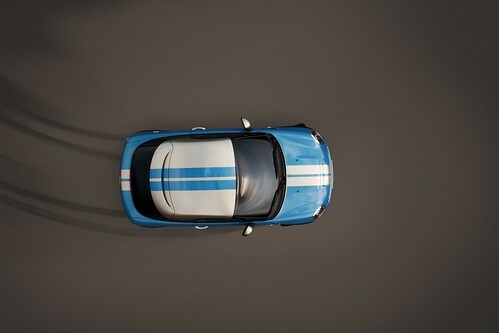 The body design of the MINI CoupÃ© Concept also bridges the gap from the earliest days of the Miniâ€™s history all the way to the more distant future of the brand, emphasising the unique nature of the concept as well as its full membership in the MINI family. At the same time the individual and emotional design language arouses the expectation of a particularly thrilling experience on the road. Especially at the front end of the car a number of icons typical of the brand, as well as the design style so characteristic of MINI, all come together to create a strong family resemblance. In addition, the individual look of the MINI CoupÃ© Concept comes out also in the side view of the car as well as in the design of the rear end. This unique new two-seater measures 3,714 millimetres (146.2″) in length and 1,683 millimetres (66.3″) in width. Height is 1,356 millimetres (53.4″). Through these dimensions and its athletic proportions alone, the MINI CoupÃ© Concept stands out from the beginning as a compact and muscular sports machine. The new concept car carries over the unmistakable front end look from the four-seater MINI. Smoothly balanced contours on the engine lid characterised by wide and sweeping radii, the large headlights, the homogenous shape of the radiator grille and the wide lower air intake give each model that unique look, openness and charm so typical of the brand. Through the greater rake of the windscreen on the MINI CoupÃ© Concept, the car looks even more striking and dynamic, the low and streamlined body proving clearly that the MINI CoupÃ© Concept is a particularly outstanding performer. The chrome radiator grille on the MINI CoupÃ© Concept is the same as on the MINI Cooper S. The inner section in the grille is however finished with bars in body colour creating a clear sign of distinction at very first sight from the other members of the MINI family. The bonnet stripes also extend into the radiator grille to provide an even more sporting and dynamic touch. The side view of the MINI CoupÃ© Concept also brings together features typical of the MINI family and new highlights in design to form a fascinating whole. The front side panels, for example, come straight from the MINI Convertible. The body joint forming the diagonal line characteristic of every MINI along the front lid and the surrounds on the front side indicators bearing out the style of the MINI Cooper S again provide an unmistakable sign of distinction with historic roots â€“ here the classic Mini had a visible welding seam along the body. All this now comes out even more convincingly in the MINI CoupÃ© Concept, also through the unique flow of the roofline. The glazed section of the passenger cell referred to as the greenhouse, for example, is much lower and even more dynamic than on the brandâ€™s â€œregularâ€ models. 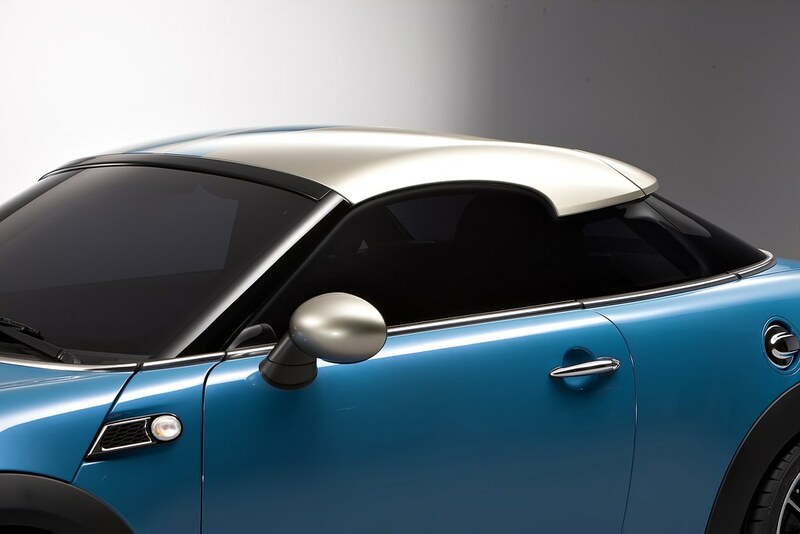 Another feature of the MINI CoupÃ© Concept is the strongly inclined windscreen merging gently into the roof. At the rear the roofline initially moving straight back above the heads of the driver and front passenger flows on into the sturdy C-pillar. 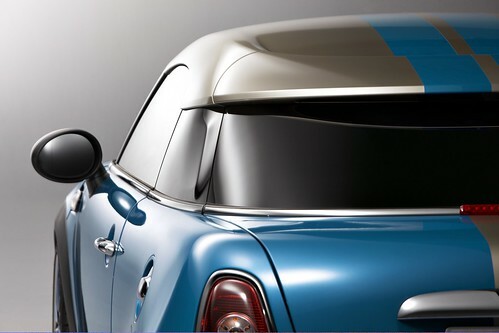 The entire roof with all its contours thus comes in a bridge shape quite unmistakable and featured for the first time on the MINI, made up of a strong rear cornerstone formed by the C-pillar and the almost filigree structure above the passenger cell. The C-pillar is a strong visual expression of the particularly solid and torsionally rigid body structure providing not only superior occupant safety, but also the agility typical of MINI in fast manoeuvres. 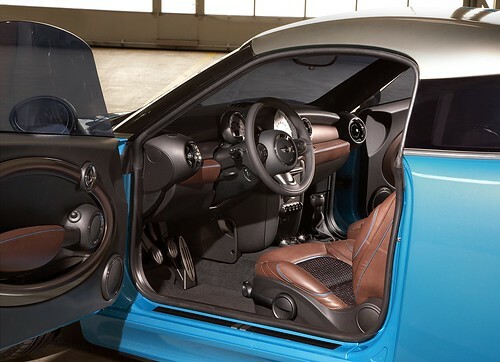 The C-pillar very powerful in design serves at the same time to guide your perspective towards the rear end of the car, while the side view of the MINI CoupÃ¨ Concept forms a very strong and convincing wedge shape created by the roofline tapering out to the rear and the waistline rising up slightly in typical MINI style. All this gives the MINI CoupÃ© Concept a forward-moving impression right from the start, the car clearly expressing its power and muscle even at a standstill. Through its design alone, therefore, the MINI CoupÃ© Concept authentically visualises sporting qualities of the highest standard. The rear-end design of the MINI CoupÃ© Concept consistently follows the need to optimise the flow of air in the interest of both driving dynamics and efficiency. The principle of â€œform follows functionâ€ so essential to MINI, the look and design of various body elements, fully reflects the characteristic features and qualities of the car. Through its design alone, therefore, the MINI CoupÃ© Concept clearly confirms its sporting potential in a particularly credible and convincing manner. 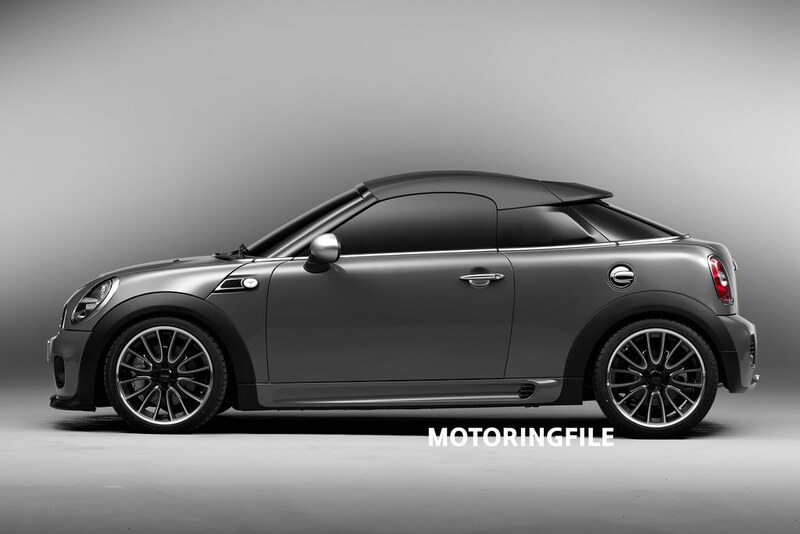 The rear spoiler with its wing profile at the same level as the C-pillar also makes a particularly effective contribution in guiding the air along the rear end of the MINI CoupÃ© Concept. This large air guidance element spans the entire width of the roof, increasing aerodynamic downforce on the rear axle. Tapering down elegantly, the rear window on this unique two-seater merges into a short and low rear end with staged contours in typical coupÃ© design. Again, this follows the overriding objective to ensure an optimum flow of air without any turbulence harming the carâ€™s aerodynamics â€“ which is also why the air spoiler on the rear panel is appropriately sharp and clear in its profile. Beneath the air spoiler at the rear the overall look and design of the MINI CoupÃ© Concept follows the typical philosophy of the brand. Horizontal lines running parallel to one another emphasise the wide track of the car, the body growing wider from top to bottom in cascading style highlighting the muscular stance of the car resting on its wheels in that characteristic style. The rear light clusters in upright arrangement and surrounded by a wide chrome frame are also typical of the brand. The rear air dam on the MINI CoupÃ© Concept, in turn, comes with a diffuser split up into two sections and ensuring a smooth, swirl-free flow of air beneath the car. Impressively functional: wide-opening tailgate, â€¨generous luggage space. The tailgate on the MINI CoupÃ© Concept is yet another highlight of the car. Deliberately foregoing the rear seat bench, this unique two-seater offers lots of additional space for taking along all kinds of luggage. Luggage capacity is 250 litres or 8.8 cu ft. To use this space most conveniently, the rear end of the MINI CoupÃ© Concept comes with a large and wide-opening tailgate. Hinged above the roof spoiler, the entire tailgate including the rear window swings up gracefully, offering convenient access to the generous luggage space behind the rear seats of the car. And thanks to the low loading sill, accessing the luggage compartment with even heavy and bulky objects is significantly easier. The complete design of the rear end with its large tailgate is yet another example of the functional design so typical of MINI. All options offered through the concept of the car are optimised to the highest standard through carefully thought-out solutions and a good overall balance. Indeed, this principle already to be admired on the brandâ€™s existing models, for example through the easy-load function on the MINI Convertible, makes a significant contribution to the overall substance of the car. The result is a wide range of innovative solutions quite unique in the market, emphasising the premium character of the MINI brand. On the MINI CoupÃ© Concept this philosophy is borne out by yet another distinctive feature providing extra space and practical value: The bulkhead between the passenger and the luggage compartments comes with a lockable opening. The through-loading provided in this way, quite unusual on a two-seater coupe, gives the driver and passenger direct access even while driving to travel items they are taking along in the luggage compartment. So that bags with, say, beverages, a music CD or maps are stowed away safely but always within easy reach. The MINI CoupÃ© Concept combines the vision of a compact sports car with thrilling agility, on the one hand, and the individual flair and style of the MINI, on the other. Through its entire concept, the car is perfectly designed to offer concentrated driving pleasure of the highest standard. This is borne out not only through the extroverted exterior in its fascinating, sporting look, but also through the interior conceived from the start for active motoring. 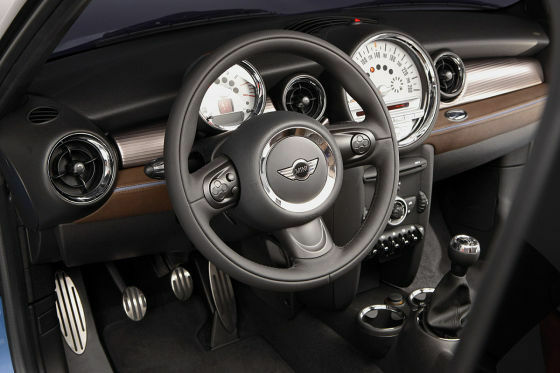 The MINI CoupÃ© Concept also comes with a large rev counter directly behind the steering wheel, while the speedometer is part of the central instrument in the upper section of the dashboard. This circular instrument well known as the Center Speedo also houses the audio system as well as the optional entertainment and navigation functions. The colours and materials featured inside the MINI CoupÃ© Concept symbolise the classic sportiness of the car. Like the dashboard, the roof lining of this unprecedented two-seater comes in black providing a calm atmosphere just right for concentrating on driving conditions and essential requirements. Black trim bars combined with a carbon interior trim strip, finally, further enhance this purist look. Lightweight construction and modern suspension technology â€¨providing a new feeling of go-kart driving. 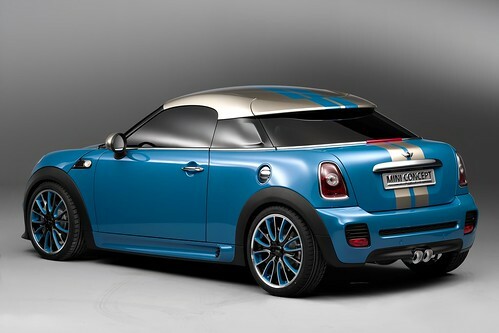 The MINI CoupÃ© Concept is definitely a MINI and definitely a sports car. The particular charm of this combination results from both the drivetrain and the suspension technology already featured in the current production models, as well as the special highlights of this two-seater concept car. EPS Electronic Power Steering with speed-related power assistance, finally, ensures precise manoeuvring round bends and gives the driver exact feedback at all times on road and driving conditions. At the same time on-demand management of steering assistance serves to maximise the carâ€™s efficiency. 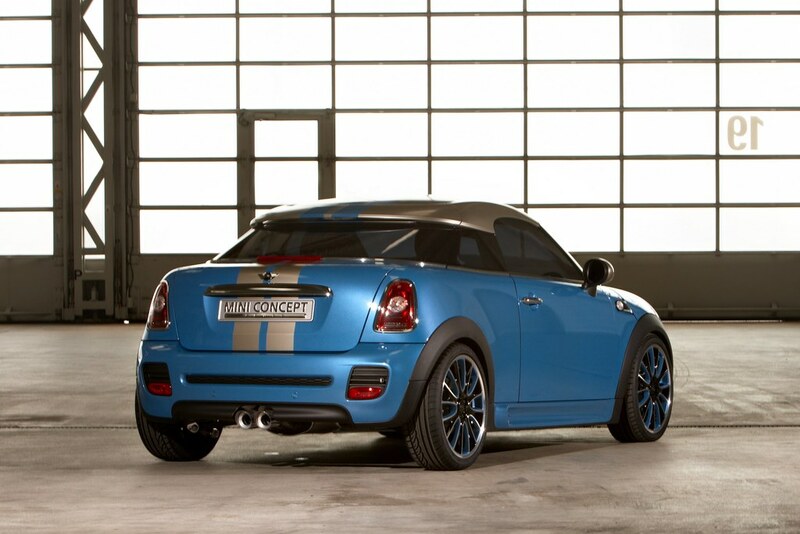 The MINI CoupÃ© Concept offers ideal conditions for raising the go-kart feeling created by the carâ€™s drivetrain and suspension technology to an even higher standard. Its entire construction is based on a lightweight concept reducing weight particularly where it really counts for even greater agility. As an example, this two-seater comes with an aluminium roof not only optimising the overall weight of the car, but also lowering the carâ€™s centre of gravity for a significant reduction of body movement and optimised driving behaviour. Since lower weight also means greater efficiency, the MINI CoupÃ© Concept again offers the option to combine even greater driving pleasure with fuel consumption and CO2 emissions reduced to a minimum as an important sign of our times. Sporting success and agile handling of the highest standard are significant highlights in the history of MINI now going back five decades â€“ and both factors have made a fundamental contribution to the ongoing popularity of this small premium car. Three overall wins in the Monte Carlo Rally and the concept of driving pleasure expressed so clearly by the carâ€™s go-kart feeling definitely confirm the sporting potential of this small compact both back then and today. The anniversary year is therefore the ideal time to present the MINI CoupÃ© Concept as the vision of an uncompromisingly active sports car. Another concept car presented even before the re-launch of the MINI brand proves that this philosophy has always fuelled the creativity of the MINIâ€™s designers: The MINI Concept Monte Carlo presented in 1997 was a two-seater with a 160-hp mid-mounted engine. Through its design alone, this concept car already came with a wide range of features destined to be taken up again by the first MINI, short body overhangs front and rear, round headlights and the re-interpretation of the hexagon radiator grille providing an outlook at important styling elements on the production model to follow later. With its extremely powerful body and direct references to motorsport, the MINI Concept Monte Carlo also made a clear pledge to the rally history of the brand. Now the MINI CoupÃ© Concept, through its unique look, takes up the almost aggressive and extroverted appearance of that former concept car, at the same time providing a new link between the history, the present and the future of the brand. It takes up traditional values of the MINI brand and combines them with the most advanced technologies to offer a fascinating vision of how the MINI model family may continue. Once again, therefore, MINI is following the needs and wishes of new target groups fully appreciative of the individual style of the brand and associating this character with clearly defined product features. The MINI CoupÃ© Concept addresses the motorist thrilled by that unique combination of driving pleasure, lifestyle, and premium quality so typical of MINI and, at the same time, looking for sporting driving qualities of an even higher standard. You can download the full hi-res here.